Christie and Euromet are partnering to offer ceiling mount and rigging solutions for Christie 1DLP projectors. The partnership includes ceiling mount hardware for Christie H Series, and a rigging frame that works with both Christie H Series and Christie Q Series. 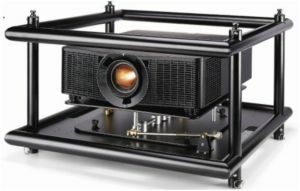 A Christie 1DLP projector laying in the horizontal position. Based in Italy, Euromet designs, develops and manufactures industrial strength solutions that are renowned for their quality, durability, and ease of use. With its attention to detail, Euromet delivers adjustment accuracy and meticulous calibration across the x-axis and y-axis.